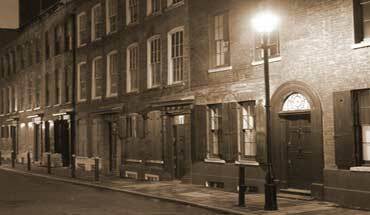 The ghosts of London’s West End are a truly eclectic bunch and, on this tour, you will confront them in their natural habitat as you explore the gaslit alleyways, tucked away courtyards and hidden recesses where the spectres of London’s Theatreland are known to lurk. 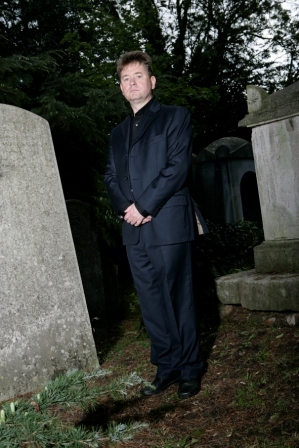 Your guide for this walk of London's most haunted locations is author and broadcaster Richard Jones -London's Master of the Macabre - a man who has devoted more than 30 years to researching and writing about the darker and more sinister side of London's history. Richard has carried out on the spot research at over 4,000 haunted locations around Britain and Ireland, and, as the author of four books about haunted and mysterious London, he is the perfect host to introduce you to the streets, and the ghosts, of the Capital. Because of Richard’s unrivalled credentials, this tour is the most in depth and up to date look at the haunted theatres, pubs, creepy churches, historic buildings and dark alleyways of London’s West End. Indeed, no other Theatreland ghost walk comes close to matching this one in the paranormal stakes - nor, for that matter, for the number of haunted locations visited. 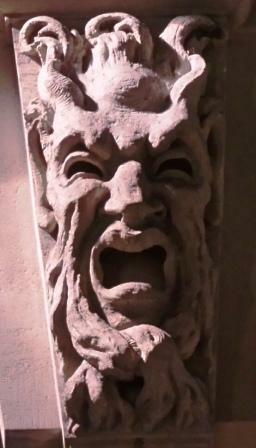 Even the underground station from which the tour departs has its own resident ghosts! You might even have encountered one of them as you left the station and not realised! 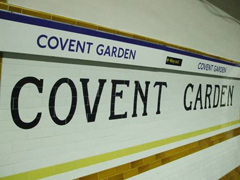 The ghostly activity at Covent Garden Station has been reported in newspapers all over the world for close on 50 years, and Richard will begin by bringing you up to speed on all the apparitions that have been seen in its depths. 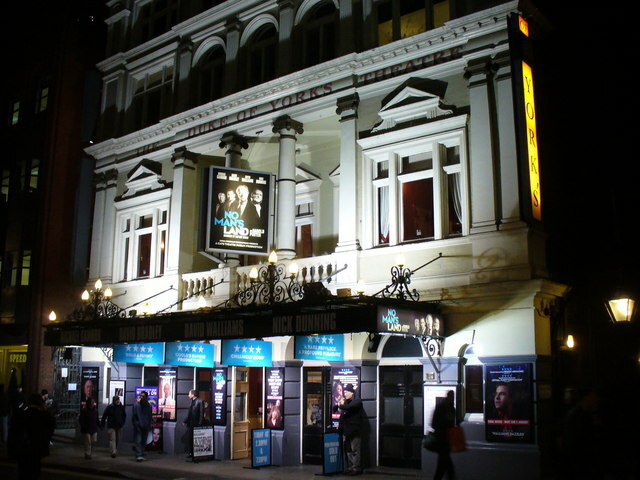 Then, as twilight drapes itself across the streets of London’s West End, the ghost tour heads off into the shadowy recesses to reach the next haunted location - which was once one of the most important buildings in this area. There will be time aplenty to experience the ghosts here. Will you set eyes upon the ghostly lady who, in the past, has been known to terrify maintenance workers and decorators alike with her "unearthly" presence? Will you hear the plodding footsteps that are still said to echo from the depths of the building in the dead of night? Will you, perchance, get to hold a conversation with the spectral man who, for a time, will listen intently to what you have to say but who will, rather rudely, vanish into thin air before you have time to finish?. One thing is certain. The chilling tales that you will hear will set just the right mood as Richard begins to lift the curtain on the haunted streets of London's Theatreland. 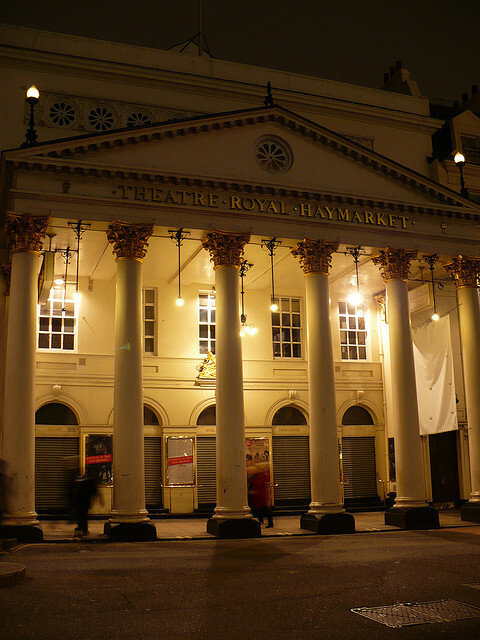 Next up is London’s oldest, and most haunted, theatre. 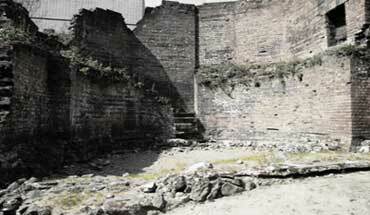 Oh, the tales the history encrusted walls of this place could tell if only they could speak. Tales of triumph and tragedy, of murder and betrayal, of the highs and the lows of the careers of the famous and forgotten stars of the stage whose living selves once appeared here, and whose departed selves are not going to let a little thing like death prevent them from treading the boards once more. The walls themselves will, probably, remain mute. But worry not oh fearless phantom hunters, for Richard will be on hand to tease those tales from the cold stone and he will regale you with the stories of the ghostly goings on at the theatre. Tales such as that of the ghostly clown whose mischievous spirit has been known to administer a well-aimed kick at the unguarded behinds of many a leading lady or man. In the darkness of the alleyway that runs alongside the theatre, Richard will tell you, in hushed tones, of the disembodied white face that has been known to scare the wits out of hapless witnesses who have turned to find it floating, eerily, in mid-air behind them. But, by far the most famous ghost to roam this place is that of the man in grey - one of Theatreland's best known ghosts, and one who managers, producers and actors alike are absolutely delighted to see! 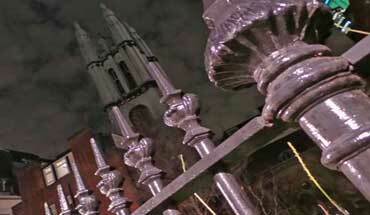 You’ll hear the full story on the ghost walk. From these phantoms of the footlights we will drift through the heart of Covent Garden Market to the location where several witnesses have, over the years, come face to face with the ghost of a “floating nun”. 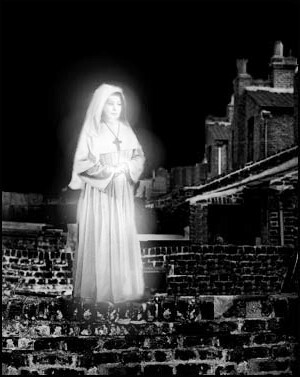 Now, let's be honest, if there’s one type of ghost that you would (metaphorically at least) just kill to see, a floating nun would, surely, be high up on the list - especially since a sighting of this particular hovering holy woman is meant to presage great success for those who set eyes upon her. So we’ll linger here for as long as time, and the hovering security guards, will allow in the hope that the nebulous nun will honour us with an appearance. By now twilight's ghastly grip will have, well and truly, taken hold in the dark recesses and gaslit alleyways into which the ghost walk then ventures as, by way of London’s oldest restaurant - where an invisible entity is wont to flush the toilet in the ladies loo at the most inopportune of moments - we arrive at the stage door outside which one of the most notorious murders of Victorian Theatreland took place on a dark December night in 1897. You will stand on the very spot where one of the greatest actors of his age was stabbed to death by a bit part player who had grown insanely jealous of his success. Richard will build the tension as he presents you with a full, and accurate, account of the tragedy and its immediate aftermath. He will also tell you of the numerous occasions when the ghost of the fallen heart throb has appeared at theatre, outside which his living self met his "untimely end" in 1897. But the ghost's appearances are not confined to the interior of the building. 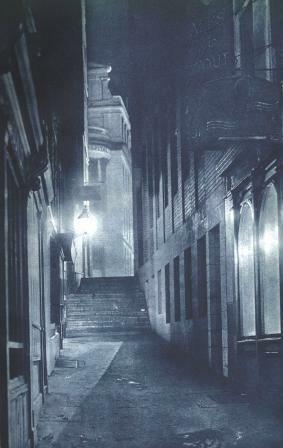 Indeed, the actor's fleeting phantom has been seen on the site of his murder, and several people on the tour have even caught an indistinct "something" on photographs which they have taken in the alleyway through which we then venture en route to our next haunted location. You could be forgiven for thinking that our next stop is of little interest when it comes history and hauntings. But you wouldn't be more wrong. For this location is a bank to whose care the highest in the land entrust their family fortunes, and, in some cases, have done for many generations. 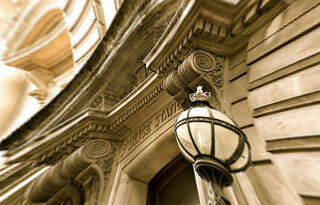 This bank is one of the most exclusive in the country, numbering no less a person than the Queen herself - not to mention various members of the nobility - amongst its impressive list of clientele. So the fact that a member of the nobility should have decided to pay regular visits to its illustrious interior during the 1990's might not seem that remarkable. But, the fact that he chose to do so minus his head, now that's remarkable. Indeed, his frequent appearances, and the subsequent disruption they caused, didn’t go down too well with the bank’s directors who went so far as to call in a psychic medium to convince the nebulous noble to depart the premises and to trouble them no more. From this headless diversion, we delve into the even darker recesses of the West End to encounter a rapid succession of haunted theatres. One of them is haunted by the ghost of a former manager who so despised critics that his ghost still makes periodic returns to the theatre’s "Phantom Staircase" to ensure that the gentlemen, and women, of the press are behaving themselves at what is still, very much, his theatre. Another theatre witnessed a disturbing series of events in the late 1940’s when actresses who wore a particular garment during performances became much alarmed by the sudden realisation that some malevolent force was causing the garment to tighten around them as though attempting to strangle them. Richard will tell you of the long ago act of infamy that, reputedly, lay behind the garment's bizarre behaviour, and he will also tell you about the various actresses who experienced the crushing hostility of the strangler jacket. 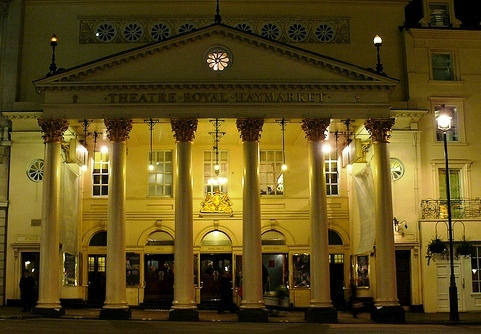 Our final destination on the West End Ghost Walk will be one of London’s most beautiful and historic theatres. It is a stunning and beautiful building which also happens to be haunted by the ghost of a former manager whose restless wraith has been seen by the likes of Sir Patrick Stewart and the late, great Sir Donald Sinden. In 2009 Richard interviewed Sir Donald at this very theatre and at the exact spot where he saw the ghost. You will hear the story just as Sir Donald told it and you will be shown the window at which he was standing when the theatre’s resident phantom strolled on by. In addition to hearing the most up to date versions of some of the West End's best known ghost stories, Richard's walk will also take a look at various traditions and superstitions of Theatreland. Do you know why it's considered unlucky to whistle back stage? Have you ever wondered why it's not the done thing to utter the name of Macb......, sorry, the Scottish play? Has it ever crossed your mind why breaking a leg should be looked upon as such a good omen? You will learn the origins of all these traditions and superstitions, and many more besides, on a tour that will be steeped in theatrical lore and legend. The Ghosts of the West End Walk can be booked as a private tour for your office social, tour group, or even as an outing with a difference for a group of friends or relatives.